The Institutions page allows you to manage your institutions and assign various information to each institution. An Institution represents a single church or a grouping of churches. Institutions can have sub-institutions under them to distinguish the hierarchy between them. Institutions with sub-institutions cannot be deleted until all of the sub-institutions have been deleted. Before adding institutions, you may want to add individuals and positions that are associated with your institutions. Within each institution, individuals are assigned as leaders or assigned to positions. To add an individual, select the Add New Family option from the Membership menu. For more detailed information on adding an individual, see the Add New Family video tutorial. A position is the specific job that an appointee of the institution fulfills. Before positions can be added to an institution, they must be established on the Lookups page (From the Administration menu, select the Lookups option and then scroll down and select the Positions link listed). The same position can be used multiple times per institution. For example, you may have two individuals assigned to the position of "Staff" at the same church. But, each instance of the position can only have one current appointee. 1. Start by navigating to the Institutions page. From the Headquarters menu, select the Institutions option. 2. Next, click the Add New Institution icon. 3. 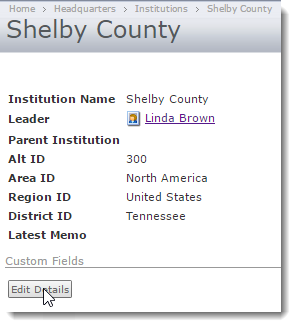 When adding an institution, the Institution Name and Leader fields are required. Select the Parent Institution from the drop-down list when entering a sub-institution or leave blank when entering a parent institution. Enter the ID fields as appropriate (optional). Click the Update button when you are done. 1. Click the Institution link listed on the grid corresponding to the institution you would like to modify. 2. Notice there are three tabs of information available: Institutions, Positions, and Memos. Let's start by selecting the Institution tab and then clicking the Add link to add a new sub-institution. 3. Enter the information for the sub-institution and then click the Update button. 4. Next, click the Positions tab and then click the Add link. 5. Make your selection from the Position Name drop-down list and then click the Update button. 7. To add a memo to this institution, select the Memo tab and then click the Add Memo link. 8. Enter a memo and then click the Save icon when you are finished. Click the Show Treeview link to view the institutions in a chart form and click the Hide Treeview link to only display the Institutions grid. The Institutions grid contains information about the sub-institutions. Click the Institution or Leader link to edit those records. The Custom Fields tab is an optional area which allows you to further customize and track detail information. It is available when you edit an Institution, Position, or Appointment. 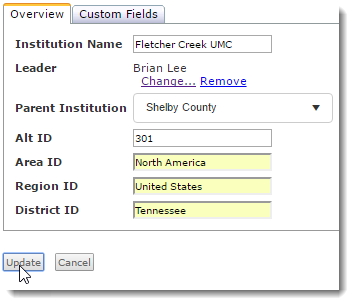 Although Custom fields can be added one at a time to each Institution, it is recommended to use Custom Field Groups. 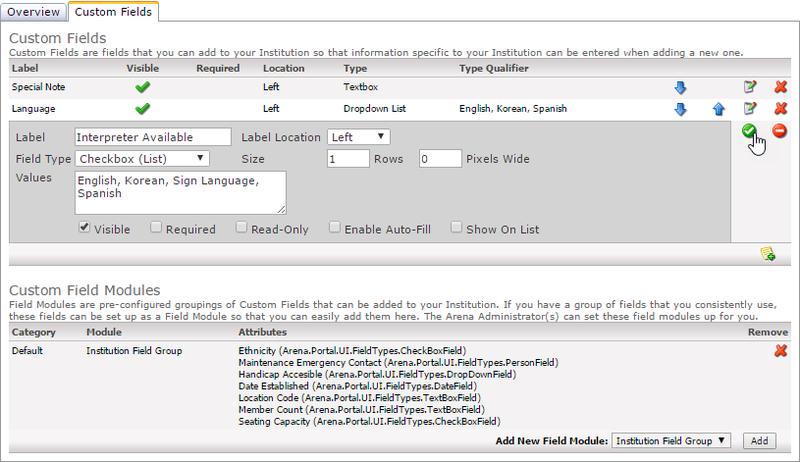 Custom Field Groups allow you to group together your custom fields and then use them as a template for each Institution. 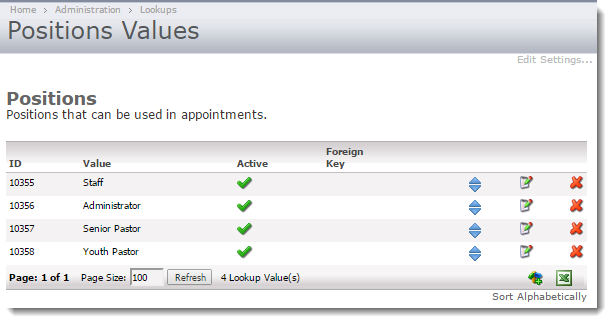 (Custom Field Groups can also be used for Positions or Appointments.) For example, instead of manually adding 5 custom fields to each institution, add 5 custom fields to a group and then select the group of Custom Fields on each institution record. This saves time and also allows you to report on these fields later because they are all related instead of being independent. 1. Select the Custom Field Groups option from the Administration menu. 2. Add a new field group by clicking the Add New Custom Field Group icon. 3. Click the Edit icon next to the Field Group that you just added. 4. 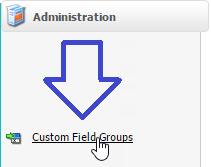 Change the default name from "New Field Group" to something more descriptive for what you are doing, such as "Institution Field Group" and then click the Save icon when you are done. 5. Next, click on the Field Group link. 6. Now it's time to add some fields. Locate the Add New Custom Field icon in the lower right-hand corner and click on it. 7. Specify the parameters for the Custom Field and then click the Save button. 8. Continue adding Custom Fields and review what you have added. Click and drag the Move icon to reorder the fields. Now you are ready to add this Custom Field Group to your Institutions. The following steps below to add a Custom Field Group to an institution. 2. Navigate to your desired institution and then click on the Institution link. 3. Next, click the Edit Details button. 4. Select the Custom Fields tab. 5. Select the Custom Field group from the Add New Field Module drop-down list and then click the Add button. Below is an example of a Custom Field Group assigned to an Institution. Detail information about the parameters of a Custom Field are listed below. •Title: Enter the name for the custom field. •Title Location: Select the label location. Options are left, right, top, or bottom. •Type: Select the type of field to use. �Address: A field for registrants to enter an address. �Area: A field to specify a page to display the group area. See Groups Areas for more information. 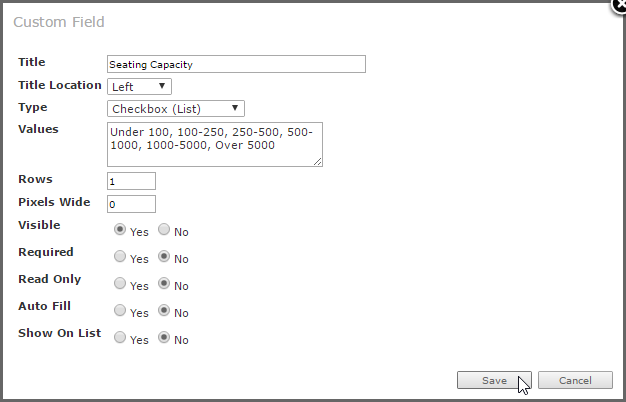 �Check box: A field to create a multi-select list of options for registrants. Enter the options in comma-delimited format in the Values field. �Custom Query: A field to enter a custom query in the Query field. �Date: A field for registrants to enter a date. �Document: A field for registrants to attach a document. You first need to select a Document Type to associate with uploaded registrant documents. Document Type is a customizable Lookup. See your Arena Administrator if no Document Type is available. 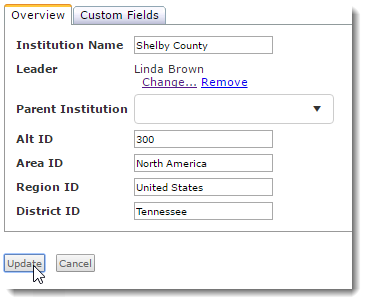 �Drop-down List: A field to create a drop-down list of options for registrations to select. Enter values in comma delimited format (e.g. Option A, Option B, Option C) in the Values field. �Image: A field for registrants to upload an image. �Lookup Type: A field to select an existing drop-down from Lookups. �Person: A field for registrants to search for a single existing record, using default Person Page ID (7). 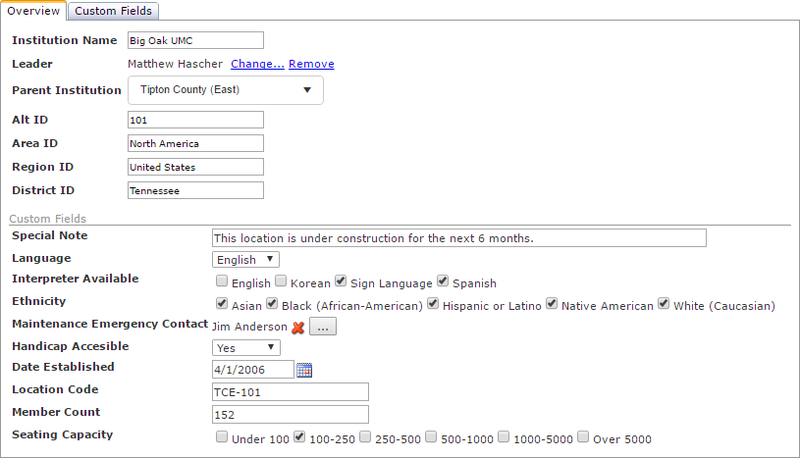 �Phone Number: A field for registrants to enter a 10-digit telephone number with the option to enter an extension. �Radio List: A field to create a single-select radio list of options for registrants. Enter values in comma-delimited format (e.g. Option A, Option B, Option C) in the Values field. �Rich Text Field: A field to enter rich text. �Static HTML Content: A field to enter static text or static HTML-formatted text in the HTML field. �Text box: A field for registrants to enter text. �Rows: Use this option to adjust the number of rows to use for the custom field, e.g., a rich text field, or static HTML content. �Pixels Wide: Use this to specify the width of the custom field. •Values: Depending on the Field Type, you may be required to enter a value for the choices presented. Field Types that require this are check box, radio, drop-down, and static. These values are comma-delimited for multiple values. •Rows: Some Custom Fields can have a size requirement added to them by using the Rows or field. For example, you could specify that a Text Box contains "3" rows of data. •Pixels Wide: Some Custom Fields can have a size requirement added to them by using the Pixels Wide fields. For example, you could specify that a Drop-down control is "500" Pixels wide. •Visible: Select this check box to make the field visible both internally and externally. If you don't want this custom field to display on your institutions, do not it or you may end up with orphaned data records. Select the "No" radio button to make this field not visible. This retains the data in your database even though the field does not display in Arena. You also have the ability to make the field visible again and have the data display. •Required: Select this check box for fields that are required to select or complete. •Read Only: Select this check box for view only fields. This makes the field display as a disabled field (grayed out). •Auto Fill: For Events behind a member login, select this check box for required custom fields. •Show On List: Select this check box for fields to display on the Tag-Member page. If available, select a Custom Field Group. If not available, see your Arena Administrator. To remove a Custom Field or Custom Field Module, click the Delete icon next to the field/module you want to remove. The Custom Field cannot be in use. Follow the steps below to manually enter Custom Fields. 1. Navigate to an Institution and then click the button. 2. Select the Custom Fields tab and then click the Add New Custom Field icon. 3. Next, specify the parameters for the Custom Field. 4. Click the Save icon when you are finished. •Click the Edit icon to make changes to a Custom Field. •Click the Up Arrow icon to move the custom field up in the listing. •Click the Down Arrow icon to move the custom field down in the listing. •Click the Update button when you are finished adding or modifying custom fields. 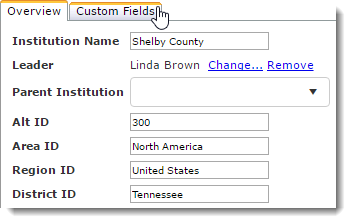 Below is an example of how the custom fields and custom field groups display seamlessly on an Institution record under the "Custom Fields" header.